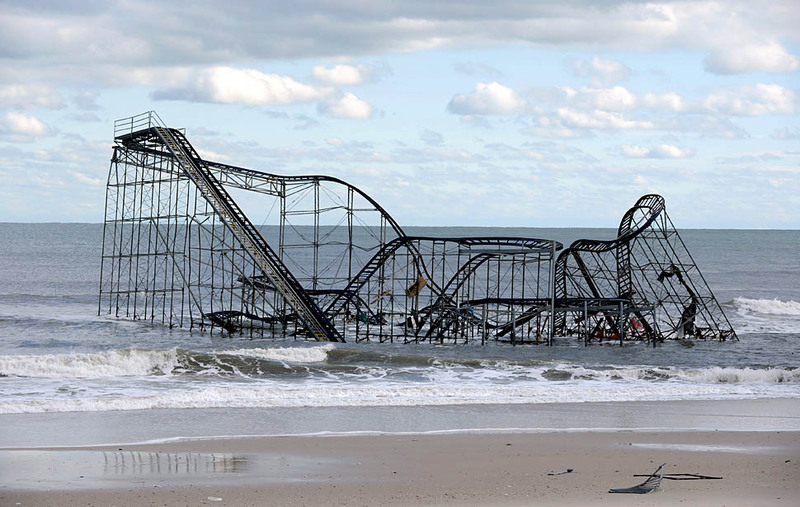 I thought this was a particularly cogent picture to choose from the massive wreckage of Hurricane Sandy. What was once jokingly coined the Frankenstorm because of its combination of a massive nor’easter and a Hurricane (and its near-Halloween arrival), quickly shaped into one of the worst storms to ever hit the Northeast. The picture represents a loss of innocence; a fun roller coaster meets the strength of a storm. It is almost unreal to witness the devastation. As a New Yorker, I can confidently say that individuals from New York and New Jersey are gritty. We handle adversity well. But the force of Mother Nature has left almost all residents shocked. And we are still feeling it. My house is without power, but my family is safe, and that is all that is important. Although I experienced the storm, I am writing this post miles away from New York. I am in San Diego covering a conference for my work. Thus, I do have an opportunity to let you all know that I am alright, and I look forward to getting back to posting on a more consistent basis. It goes without saying that my posting schedule has been cut lately. It has almost been nonexistent. You can expect a Music Court revival after the new year. Yes, come 2013 I can guarantee a schedule of more frequent posting. Until then, I hope to complete at least two posts a week (one being a new band). New bands please continue sending your material to musiccourt@gmail.com. If I do not get back to you immediately, please be patient. I receive a large amount of e-mails, and I usually read them in bulk (once or twice every week). I will get back to you. New bands I would like to cover are put on a list, and I follow it chronologically. I love listening to all of the new music and writing engaging posts about them. So, how about we get to some music…or rather a video. I am having some difficulty embedding it, but since I really do enjoy its inventive structure, I urge you to check out the video of The Lost Brothers’ “Blue Moon in September”. The Lost Brothers are made up of Mark McCausland and Oisin Leech, an Irish duo. They released their first indie/folk album in 2008. The video of hand-crafted props and puppetry tells an odd story that features paper clouds, a clay moon, and a baritone beluga. The song itself swoons like the light rocking of a ship on the seas…or in the case until you are attacked by a sea monster.